1898 1:2,500 OS map. By 1876 the trainshed had been extended on a curve with a line running through the back of the trainshed onto the new pier. Further rebuilding of the station started in 1893 using land reclaimed from the sea, with the pebble beach being pushed south. This map shows that the trainshed has been demolished and the station has been rebuilt as a through station with tightly curving platforms. The new arrangement allows boat trains to run onto the extended pier which is now used by most continental passenger ferries, for which two landing stages are seen. To the south of the station, on the up side, a trailing line leads to pairs of carriage berthing sidings were laid in 1893. Additional sidings are also seen on the south side of the goods yard. Three new signal boxes are shown. One is on the up platform, and this controls access to the carriage berthing sidings. The second box is seen by the trailing junction to these sidings, and it controls the tracks running onto the pier. The third box is on the pier. Two footbridges span the passenger lines; one links the two platforms and the second is alongside the level crossing to the north of the station. 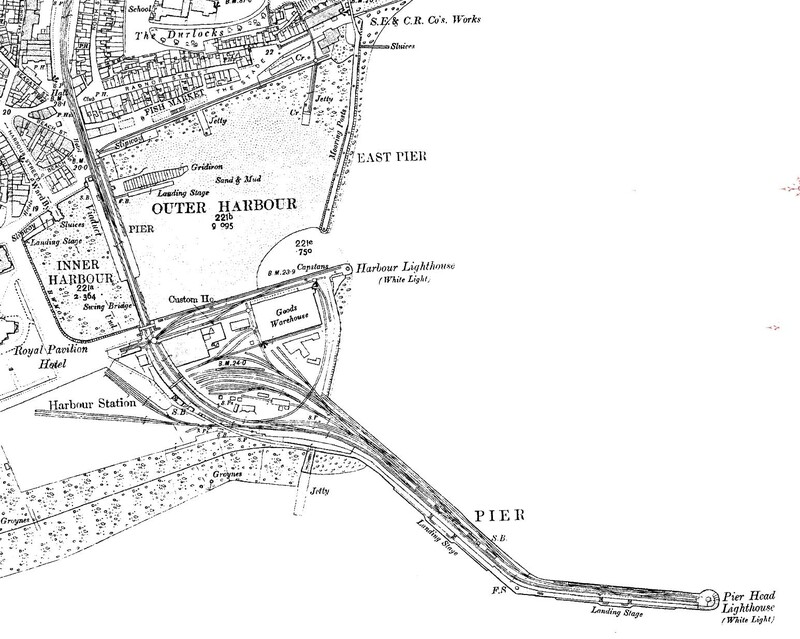 The goods yard was still reached by a wagon turntable between the swing bridge and the station but also from points at the north end of the down platform, or by a reversal on the pier. On the viaduct the two flanking rails have been removed and the signal box has been moved further north, but still on the up side. Folkestone Harbour's 1st short-lived engine shed is seen to the south of the goods yard . It was opened in 1881 and closed in 1894 indicating this survey was made some years before the 1898 publication date.